WASHINGTON — Congress took the easy way out to keep the government open on the eve of Donald Trump's 100th day in office, passing a weeklong stop-gap spending bill Friday that amounted to more of a defeat for the president than a victory. Lawmakers cleared the measure easily with just hours to spare before the shutdown deadline at midnight. But with Trump marking his presidency's milestone Saturday, he did not wring any major legislation out of Congress, despite a renewed White House push to revive the House GOP's health care bill in time for a vote that could give him bragging rights. House leaders are still short of votes for the revised health bill, though they could bring it to the floor next week if they find the support they need. House Majority Leader Kevin McCarthy said the plan was to pass the bill "as soon as possible." Also next week lawmakers plan to pass a $1 trillion package financing the government through Sept. 30, the end of the 2017 fiscal year. The temporary spending bill keeps the government functioning through next Friday, to allow lawmakers time to wrap up negotiations on the larger measure. The Senate sent the stopgap bill to Trump by voice vote Friday after the House approved it by a lopsided 382-30 margin. "Today's measure shows the American people that we are making a good-faith effort to keep our government open," said Rep. Pete Sessions, R-Texas. "While this is not ideal, I support this effort to provide our colleagues with more time to reach a final agreement on legislation to fund the government through the fiscal year." The struggle over both bills was embarrassing to the GOP, which has Trump in the White House and majorities in Congress. Yet even with unified control, it's proving an uphill fight for Republicans to make good on seven years' worth of promises to repeal and replace former President Barack Obama's health care law. "I'm disappointed that it doesn't go quicker," Trump said of his interactions with Congress, in an interview airing Friday on Fox News Channel. At least 18 Republicans, mostly moderates, said they oppose the health care legislation, and many others remained publicly uncommitted. That puts party elders in an uncomfortable spot because if 22 Republicans defect, the bill will fail, assuming all Democrats oppose it. 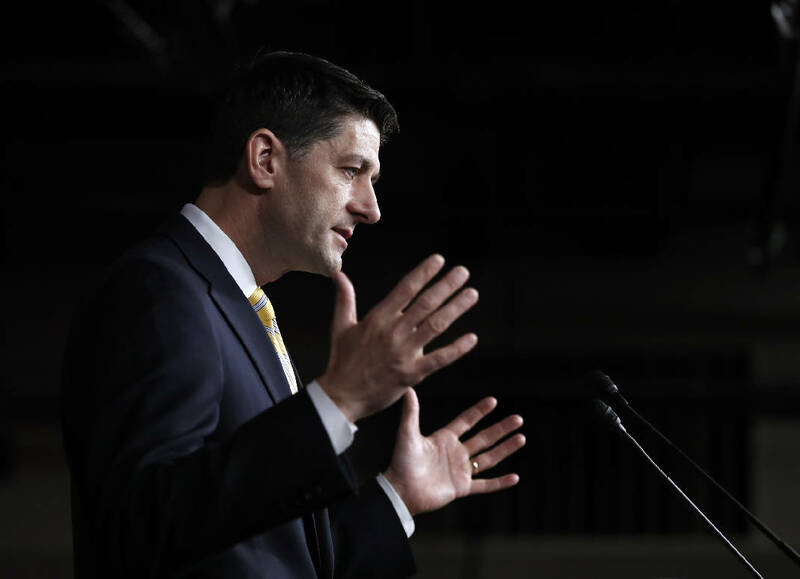 House Speaker Paul Ryan, R-Wis., wants to avoid an encore of last month's embarrassment, when he abruptly canceled a vote on a health care overhaul because of opposition from moderates and conservatives alike. Republicans have recast the health bill to let states escape a requirement under Obama's 2010 law that insurers charge healthy and seriously ill customers the same rates. The overall legislation would cut the Medicaid program for the poor, eliminate Obama's fines for people who don't buy insurance and provide generally skimpier subsidies. Centrist Republicans were the primary target of lobbying by the White House and GOP leaders. Meanwhile negotiations moved ahead on the longer-term spending bill, which would fund the day-to-day operations of virtually every federal agency. Most of the core decisions about agency budgets have been worked out, but unrelated policy issues — such as a Democratic request to help the cash-strapped government of Puerto Rico with its Medicaid burden — are among the hold-ups. Democrats denied Trump a win on obtaining an initial down payment for his oft-promised border wall with Mexico, while anti-abortion lawmakers steered clear of even attempting to use the measure to try to cut off federal funds for Planned Parenthood. But Trump and defense hawks have procured a $15 billion infusion for the Pentagon and funds for other border security accounts such as detention beds for people entering the country illegally. Republicans also are pressing for policy wins on blocking environmental regulations such as Obama's sweeping expansion of the Clean Water Act. But Democrats, whose votes are needed to pass the measure, are pushing back. Democrats praised a $2 billion funding increase for the National Institutes of Health — rejecting steep cuts proposed by Trump — as well as additional funds to combat opioid abuse and fund Pell Grants for summer school. A provision extending health care for 22,000 retired Appalachian coal miners and their families had yet to be finalized, though it's a priority of Senate Majority Leader Mitch McConnell, R-Ky., and other coal-state lawmakers like Democrat Joe Manchin of West Virginia. The catchall spending bill is the first major piece of bipartisan legislation during Trump's short tenure. Democrats have been actively involved in the talks, which appear on track to produce a lowest-common-denominator measure that won't look much different than a deal that could have been reached on Obama's watch. This story was updated April 28 at 5:30 p.m.